Die Rolle des Archivs und erweiterte Forschung beim Projekt Plan for Greater Baghdad mit Fokus auf Frauen. MMAG Foundation, 1. Nov. 2017 - 20. Jan. 2018. ‘A second original after several conversions’ or ‘Living on higher floors’ is a solo exhibition by artist Ala Younis organised at the galleries on MMAG Foundation’s campus in Amman, Jordan. The featured projects span Younis’ recent practice, and demonstrate how she interrogates the role of the archive, contemplating how it plays on predilections and flatters the imagination through lacunas and mishaps. Plan for Greater Baghdad (2015), named after American architect Frank Lloyd Wright’s 1958 proposal for a cultural site in Baghdad, features a timeline of monuments designed by artists and architects for governments in political states that are shifting. It begins with a 35mm slide taken by architect Rifat Chadirji in 1982 of a Baghdad gymnasium designed by Le Corbusier and named after Saddam Hussein. Heavily based on archives, found material, and the stories of its protagonists, Plan for Greater Baghdad examines the protection of monuments for posterity, and the expression of power in Baghdad through the enactment of city plans. The work is pieced together from fragments of stories found in archives, oral history, images and from records of gestures retrieved from representations and narratives by Iraqi artists. The piece was premiered in ‘All the World’s Futures’ at the 56th International Art Exhibition – La Biennale di Venezia (2015), and shown at the Guggenheim in New York (2016), CCS Bard (2017), and the Contemporary Image Collective in Cairo (2017). Plan for Greater Baghdad, the work’s title, offers a number of alternative readings. ‘Plan’ can be dually translated in Arabic, as both, ‘mokhatat’ or ‘scheme’ and ‘khotta’ or ‘plot’. Younis postulates that translating the word as ‘scheme’ is to focus on masterplans and maps that are contingent on political dominance manifested upon the city through art and architecture; ‘plot’, meanwhile, suggests the treatment of Baghdad as one that is itself affecting these projects. The second translation suggests a feminist articulation of history in which Baghdad purposely accommodates, adapts or reconfigures itself in response to changes in its plans. At MMAG, elements of this extended research are presented, with a focus on women whose work influenced Bagdhad’s city plans. This project awakens remains from Younis’ architectural training in the aftermath of the Gulf War, the strong legacy of modern Iraqi art, the interest in, or survival of, unverified versions of facts in narratives and an imaginary life in a city destined to be inaccessible. 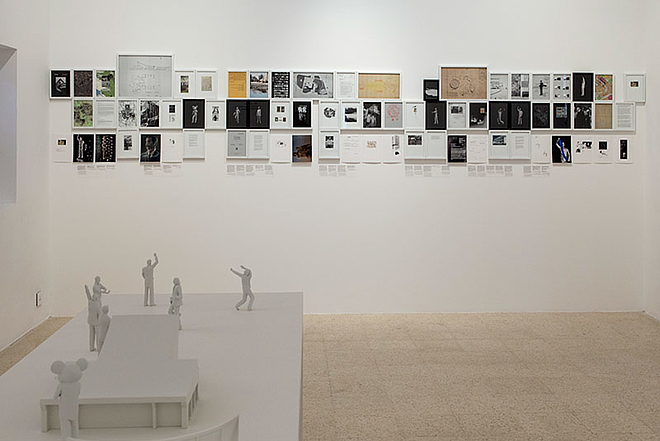 The works featured in ‘A second original after several conversions’ are based on archives and found material, and on fragments of historical representation in which elements of fact and fiction both exist. These fragments could be a rendering of a territory, a historical event, or the narrative plot of a film. Within these fragments lay possible deviations from established narratives. Enactment (2017) links the act of Iraqi artist and PFLP member Ibrahim Zayer - who shot himself in 1972, following the opening of an art exhibition in Beirut - to images of sportsmen simulating escape across Berlin’s wall in 1974. Tracing a number of other accidental performances related to obscure political situations, and examining the documentary trail subsequently left behind, Enactment seeks to probe the slippery terrain between the performative act and the creative evidence of historical events. High Dam (2015-17) is an analysis of two editions of a 70mm colour Cinemascope feature film commissioned by the UAR and USSR in the 1960s. Directed by the Egyptian film director Youssef Chahine, the two editions offer an insight into the processes that governed the politics of the era. While Hanging Gardens (ongoing) features a set of photographs and texts through which the artist attempts to prepare the ground for a future garden, Tin Soldiers (2010-11) presents a depiction of nine armies that were implicated in, or subject to, acts of war in today’s Middle East in an installation of metal figures that represents 1:1000 of the related countries’ 2010 active troops. The works represent an archaeology of recent history; they attempt to unravel dominant narratives, interrupt their persistence, and deconstruct the notion of popularity through a close examination of well-known figures and features. And while the projects presented are based in places other than Amman, the city serves as a starting point, and as an anchor, from which relationships are being built or sustained. ‘A second original after several conversions’, the English title of the exhibition, stems from the methods the artist uses in her work, the processing of archival and found materials through long studies into their relationships until they produce their own body of existence. The Arabic title, ‘سكن في أدوار عليا’ which translates as ‘Living on higher floors’, is perhaps a look into distances and overviews.